At S&S, you get quality made steel products that last. Our smallest fire pit, the 30” Elliptical Short Fire Pit is perfect for a drink outside with the boys, a small BBQ, or a warm up after a dip in the lake. This 30 inch round fire pit is also great for camping. 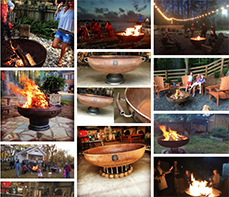 If you’re searching for your first fire pit, this is the one and when you’re ready you can easily upgrade to the next size up, our 36″ Elliptical Fire Pit. Camping, tailgating, or backyard shenanigans, this is the pit for you. Small, mighty and extremely portable, this 30 inch round fire pit features a ½” drain hole and inside handles that makes it an easy lift, even if you haven’t been hitting the gym. 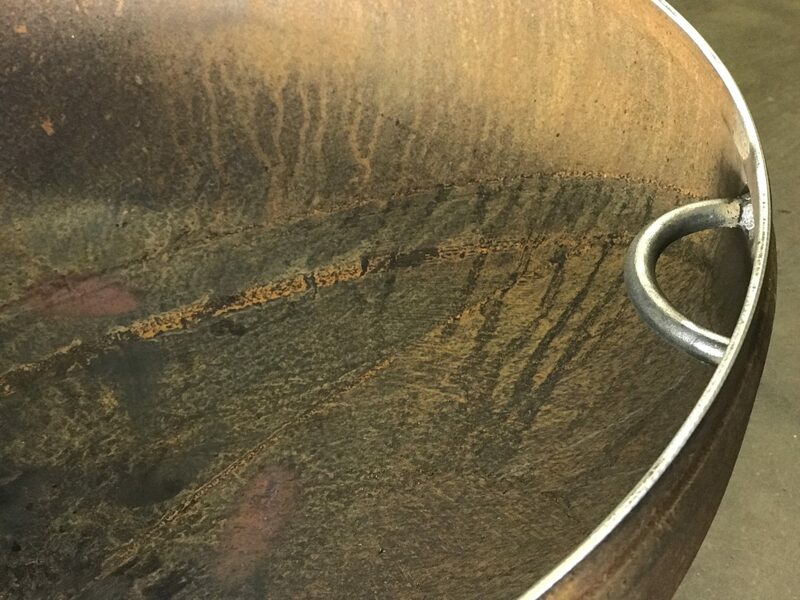 The handles are hand-made from re-purposed truck springs, so all the parts we use are from things we once loved and are extremely strong insuring that your fire pit won’t fall apart after one season. A 46” standard poker is also included, so once you find a place near the fire, you won’t have to move, you’ll be that person that can’t leave the fire alone. Thinking of a great gift for someone, birthday, housewarming or wedding? Skip the wedding registry, and give newlyweds a gift that will last forever or surprise Dad for Father’s Day. It’s a perfect gift for anyone for any occasion. We highly recommend one. It’ll make the other gifts cry. Fire is a natural stimulant, so rekindle your romance in your own backyard. Make it a date night. Our short fire pit, a pack a graham crackers, marshmallows, and chocolate will likely bring peace to the world; it’ll do wonders for you. There’s not a lot s’mores won’t heal. Add in a nice bottle of wine or a glass of bourbon and who knows what will happen. If your romance is already in full swing, this pit is a great way to encourage cooking with the children or neighbors. Small and low to the ground – just like the kids – it’s the perfect height for grilling hot dogs and hobo packs over an open flame. Our products are designed to last a lifetime, so, unlike the rest of us, these pits only get better with age. Don’t forget the snuffer and cooking grate to complete the entire package. This small Handcrafted firewood rack on legs is made out of the same high quality steel we use for our pits. It is designed to take the pain out of going back and fourth to your wood pile to grab wood while having fires. This rack measures 30" tip to tip. Keep this rack up by your pit and it will store 25-30 pieces of wood. It has a 1/2" drain hole, matches the same style as your pit and will last a lifetime.